hanksgiving is a customary North American occasion, which is a type of collect celebration. 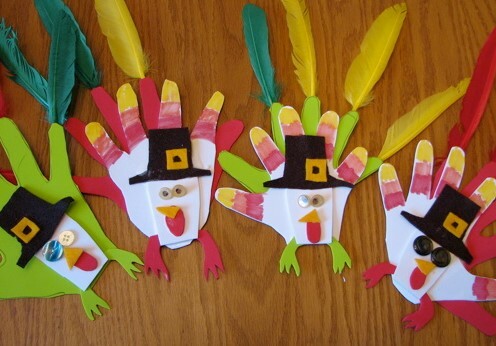 Here you will discover fun, instructive and drawing in Thanksgiving arts and crafts for youngsters. Our exercises are broadly utilized by instructors, mothers, fathers, kid mind suppliers and so on for learning and educating while at the same time being a good time for the children! Discover exercises for all ages including little children, preschoolers and kindergartners. Every one of our exercises are accessible at no cost and are allowed to print and offer. Give every youngster a 9 inch square of development paper that has been isolated into nine squares. Give every kid a chance to stick 3 inch squares of texture, backdrop or shaded enclosing paper by to the squares on their papers. Urge them to stick their squares in designs. Tape the kids' papers together to make a gathering quilt. At that point show the sew on a divider or a notice board. Give the youngsters dried weeds or blooms to put in their tubes. Utilize the finished focal point to enhance the bite table or orchestrate them on the racks around the room. Utilize darker or white fluted espresso channels to make a few pieces of jewelry for every youngster. To make pieces of jewelry, smooth an espresso sift through level. Make a slice through the fluted edges at that point cut out the inside. Punch an opening in each finish of the channel and connect 10 inch bits of yarn for ties. Give the kids a chance to enrich their channels with felt tip markers or paint. At that point enable them to cut edges along the external edges of their channels to finish their accessories. Follow kid's hand and shading dark colored body and hued feathers(fingers) Write in card: This isn't only a Turkey As anybody can see, I made it with my hand Which is a piece of me. It accompanies bunches of adoration Especially to state, I trust that you have an extremely HAPPY THANKSGIVING DAY!! Take a tp tube and cover it with dark colored development paper. Follow the two hands on white paper and let tyke shading plumes. Cut out hands. Cut thumb off. Lay tube on a level plane. Paste hands to back of tube. Cut out shelled nut shape for head and paste to the front of tube. Utilize a red bit of felt to hang down from best of his head. Include squirm eyes. Go out for a stroll and accumulate fall clears out. Cut out two circles from basic need pack around 5 or 6 creeps over. On the head stick eyes, nose and waddle cut from development paper. Paste the leaves to the external edges of one of the hover with the vast majority of the leaf standing out finished the edge … stick the other hover on top . Include two legs from development paper. Basic supply sack… cut a hover in the base of pack. Turn back to front and cut edges on the base and compose the Indian name of the kid on the back of vest. Cut egg containers into 4 columns of 3 glasses. Paste 2 segments together, consecutive, to frame chain of command. Improve with hued macaroni, froth shapes or whatever you want. Take one red Chenille, knock and shape into a "S". Paste this to the adjusted end of a pine cone with the knock projecting to some degree over the cone for the leader of the turkey. Take one orange knock and shape into a "V". Paste this under the base of the round piece of the cone for the legs and feet. Take 5-7 different knocks and deliberately twist them so the restricted finishes can be curved together leaving the puffy end to some degree adjusted. Paste the same number of these as pleasantly fits near the smoothed stemmed end of the pine cone making sure to utilize stick on the bent end of the wire. Give every tyke a Russet potato and a precut turkey head with 2 tabs at the base of the neck. Utilizing 2 parts of toothpicks, secure tabs to potato. Utilizing another toothpick scar openings in the side of the potato and place a genuine plume in each gap. Utilize 4 toothpicks as legs. A variety of the Potato Turkey is the APPLE TURKEY. Utilize the apple for the turkey body, precut turkey head, and those frilly mixed drink toothpicks for plumes. Take a wire coat holder and twist into an oval with the snare at the best. Extend a leg of dark colored, tan undies hose over holder, tie at the best. Youngsters cut out and stick on six quills, three each side. Two eyes, understudies, triangle orange nose, red gobbler, and two orange feet. We hang our own from the roof – they are delightful. Cut out an orange or yellow hover to fit a paper plate, and have tyke paste to focus. At that point have them fold up and stick shaded tissue paper (fall hues) to the outside of the wreath. Cut out a bow shape and either stick a little photo of the kid in the focal point of the bow, or have the tyke compose his/her name on the bow. Paste the bow to the outside of the plate. Talk about appreciation, and ask the youngster what they are grateful for. At that point compose that in the focal point of the plate i.e. "I am grateful for my folks.". At that point join a strip or string on the back to hang the wreath. Put the 2 bits of net together, with the edges of one at the edges of the other, making 8 focuses. pour M&Ms in focus, get together the focuses, bend and tie safely. Curl the dark colored pipe cleaner, leaving around 2″; bend the 2″ to shape the neck. Tuck the red chance upon the base of the curl to frame the wattle. Paste a little eye on each side of the head. Shape the body – the M&Ms – with the goal that the closures of the net turn into the tail and stand out the back. Embed the neck through the net in the front. For a less difficult art, print out duplicates of a turkey layout. They can include plumes in a few different ways: thumbprints in water hues, stick genuine quills on it, cut out plume shapes from hued development paper and paste on, stick on disintegrated fall leaves, even simply shading it. Materials: Several diverse hued development paper, dark colored development paper, white foundation paper. Cut a few hand prints of the kids on the distinctive shaded paper. Cut one impression for every kid on the dark colored paper. The hand print is the quills of the Turkey and the impression is the body/confront. At that point utilize your creative ability for the rest. Materials: Orange and green development paper, popcorn, paste and scissors Cut corn shape from orange paper and stem frame from the green paper. Give the youngsters a chance to stick the corn everywhere throughout the orange segment. Cut cardboard tubes (from paper towels) into 1 inch wide segments. Cut dark colored felt into 1 inch wide strips. Paste felt pieces on inside and outside of the 1 inch cardboard pieces. Give the paste a chance to dry. Touch the back of every bit of Indian corn with stick. Place the corn pieces on the ring, lining them in lines. Stir up the hues for an additionally fascinating outline. Cut out a name card on white card stock. The sides ought to be calculated like and/with the best angling. Paste corn around the best and sides of the card. You can stick some ric-a-rack on the rear to stick up over the highest point of the card. Include the name of the individual on the front of the card. Tuck the card into two pine cones as the holders. 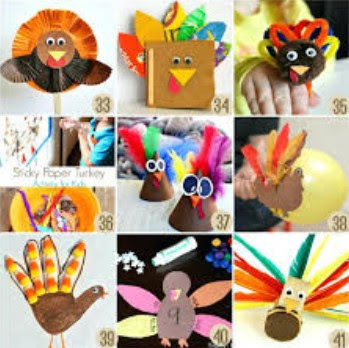 Materials: Picture of a turkey with rear quills unmistakable, label load up to stick picture on early, unpopped popcorn, rubbing liquor, nourishment shading, colored pencils or markers. Shading the popcorn by blending it with rubbing liquor and sustenance shading… .let dry in an open compartment. Have the children shading the turkey at that point stick the hued popcorn on to make his plumes. Have the youngsters cut around a 5″ hover from dark colored development paper. We furnish the kids with a precut profile of a turkey head and neck. (You could likewise utilize a square shape for the neck and a little hover for the head.) They stick its base to the focal point of the hover at around a 45 degree edge. This is stuck to an extensive sheet of illustration paper. They at that point draw the waddle, bill, eyes and feet. The kids are furnished with a wide assortment of quills cut from old backdrop. (The stores will frequently give you obsolete backdrop books.) We at that point energize the youngsters add subtle elements to their photo like grass, bugs to eat or whatever they like. 1. Examine being appreciative like stating thank you, being happy to have something or some person. 2. Place the photos of home and family questions, for example, relatives, pets, nourishment, houses, and beds on a table. Give the youngsters a chance to choose their selection of pictures. 3. Help them cut around the photos and glue it onto development paper. Print on the page " I am grateful for… ." 4. Amass every one of the pages together for a Thankful book. :- ) Ways to broaden: Use any extra pictures to make a wall painting. Tune in to Hap Palmer's "Things I am grateful for". Dear Reader: You can enable us to improve this subject even!